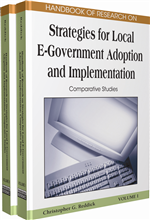 This chapter reviews various strategic frameworks for e-government which include goals and objectives. Among typical goals are the following: efficiency for the government agency, convenience for using public, and involvement for the citizen. Measurement dimensions for projects that contribute to these goals are defined (e.g., dollar value of savings) for the efficiency goal. From an efficiency standpoint, it is contended that projects can be viewed as providing “cashable” benefits for the government agency in terms of continuing revenue streams. Empirical evidence is cited showing the existence of various highyield e-government projects, as evinced by payback periods which average less than one year. Such high potential returns provide justification for further development of e-government services. If government entities underwrite the development costs of such projects, then they could not only recover their costs, but also derive the wherewithal to fund future e-government projects that can serve a variety of goals. Electronic government is defined by the Intergovernmental Advisory Board (2003, p.5) as “the use of technology, particularly Web-based Internet applications, to enhance the access to and delivery of government information and services to citizens, business partners, employees, agencies, and other entities.” This is echoed by Codagnone et al. (2006a, p. 25) who states, “broadly defined, the output of e-government is the digitalization of public service production and provision resulting from the combined effect of re-organization, personnel training, and investment in information and communication technology.” E-government applications usually cover a wide range of functions and exhibit varying degrees of interactivity. Freeman (2006) lists e-services offered by Los Angeles County and Fairfax County, VA (2008). The genesis for the present paper was local government, but the discussion has general applicability as well. Local governments face many challenging problems regarding the selection, development, measurement, and evaluation of e-services. In order to approach these questions in an effective manner, a strategic framework needs to be in place. A strategic framework for e-government may typically consist of (1) goals, (2) objectives that further define the goals, (3) the magnitudes of desired progress for each of the goals/objectives, (4) a timeline for achieving the desired progress, (5) a way (or designated indicators) to measure the progress, (6) a methodology for selecting specific projects that meet the goals/objectives, (7) specification of a common dimension within a goal to enable comparison of benefits generated by projects, and (8) an evaluation procedure with which to compare predicted and actual achievements of specific projects. Such frameworks are the foundation for e-government efforts because they can be used to validate the purpose of such programs. In the next section of the chapter some existing strategic frameworks are described, and goals that are common within such frameworks are found to include government agency efficiency, user convenience, and citizen involvement. The benefits provided by individual projects should be measured with regard to the magnitude of their contributions to the specified goals in the strategic framework. Certain projects may contribute to more than one goal (e.g., efficiency and convenience). We discuss what can be measured in relation to these goals, and we suggest that common denominators within each category be the dollar value (e.g., from position savings) for the efficiency goal, the number of user hours saved for the convenience goal, and the degree of participation for the involvement goal. Data sources for the measurement criteria for the various goals are given. The selection of individual projects to be pursued should be based on the “benefit rating” achieved by individual projects, the magnitude of progress toward specific goals specified in the strategic framework, the costs of individual projects, and the available overall budget for e-government development. Projects should only be considered if they meet or exceed some pre-specified levels for at least one goal. For example, those projects that meet the pre-specified desirability criteria for meeting the efficiency goal can be viewed as providing “cashable” benefits for the government agency in terms of continuing revenue streams. That does not per se indicate that such projects have greater overall utility than projects that focus on convenience or participation. However, such projects can influence the size of the available budget in future years by generating revenue streams that can be utilized for further e-government development, especially for projects whose main benefits lie in the convenience and participation areas. E-Government Efficiency: Obtaining increased outputs with the same resources or obtaining the same outputs or goals with lower resource consumption through the use of e-government services. Basically, efficiency is reflected in needing fewer people or positions to do the same (or perhaps even an improved) job by electronic means as compared to the manual version of providing the same service. E-Government Citizen Involvement: Degree of (added) participation of the citizenry in the democratic process of government by means of e-government services. E-Government Investment Bank: A funding mechanism created by the government agency so that it can invest in itself (to generate tangible savings) by sponsoring the development of e-government projects. The return from such projects over time would enable the agency to recoup the initial investment in the bank and make the bank a self-sustaining entity to fund future e-government projects. American Customer Satisfaction Index (ACSI): A set of causal equations that link customer expectations, perceived quality, and perceived value with customer satisfaction. E-Government User Convenience: The benefits derived from electronic services that allow the user to enjoy remote access 24/7, saving travel time and cost, encountering less administrative burden, avoiding waiting time, etc. Payback Period: The length of time it takes for the discounted net revenue stream of a project to reduce development costs to zero. At that point the original investment has been recovered, and the future net revenue stream is “profit” from the venture. Electronic Government: The use of technology, particularly Web-based Internet applications, to enhance the access to and delivery of government information and services to citizens, business partners, employees, agencies, and other entities.